The conditions for accepting this award include a list of seven things about myself that you may or may not know already, and I have to nominate bloggers onwards for the same award. This is the tough part of this nomination, because I was surprised at how limited my exposure was to quality bloggers. Which is why I took my time finding nominees. Khalid Muhammad: Author of Agency Rules, Khalid blogs extensively about politics in Pakistan (and there’s so much to blog about), about espionage (because his book is a spy thriller) and occasionally about social issues. He’s a marketer-turned-writer, a Pakistani-American who’s embraced his homeland, which is a difficult thing to do. In so many ways, Pakistan is a third-world country, and making the transition from first-world to third-world is rough, to say the least. Lisa Veldkamp: I met the modern druidess less than 5 months ago (January 2014), and in that short time, I’ve come to regard her as a friend and to admire her generosity. I recently went through her blog posts (which she charmingly calls her ‘column’) and wasn’t surprised to find a great deal of variety and depth in her words. Marialena Carr: I met Marialena over a few retweets on MondayBlogs, and I found posts covering art, science, mythology, fiction, and a range of wordless observations that made me think of the artists’ sketchbooks we studied (and kept) in art school. If anyone deserves the versatile blogger label, it’s Marialena! SS Kuruganti: SS Kuruganti is a book blogger, a professional reviewer, a fan fiction writer, and now she’s writing her own book. She’s both creative and snarky on her blog, so her nomination shouldn’t come as a surprise to anyone who knows her. Paula Reed Nancarrow: Paula is a writer and a performance artist; I know her only from Twitter, but from what I’ve seen, she’s a discerning reader, a generous retweeter, and she writes very well. Sarah Rahman: I have to confess, I don’t know Sarah very well, but I enjoyed reading her poetry, her quotes and her candid Facebook updates. She has hidden depths that I feel deserve to be explored, which is why I have nominated her blog for this award. Sumeetha Manikandan: Sumeetha is a fellow Indireads‘ author who has not one, but three blogs (blog number three is exclusively for the translation of an ancient text, which I haven’t read, but which gives me cause to admire Sumeetha more and more). She blogs about her daily life in Musings from Mylapore and runs a book blog at Book Reviews by Sumi. Drew Chial: Drew has already been nominated – Nillu beat me to it – but I feel he deserves more than one nomination. Not only is he a fantastic writer, he’s a talented graphic artist, and a very, very generous tweeter. 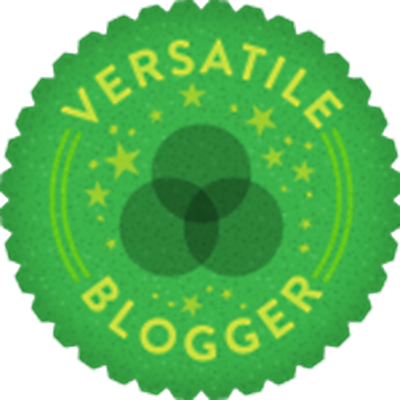 Another shoo-in for the versatile blogger award. My pen name is a tribute to a cousin I grew up with. A year younger than me, she and I got chicken pox together, fought over toys and books, took baths together when we were children (our mothers have all the pictures they need to blackmail us forever) and we stayed in touch despite distance and time. When she was eighteen, she was diagnosed with MS.
For the first 12 years of my life, I was a world traveller. I lived in three different countries and had been to 6 different schools before I got to high school. As a result, most of my friendships have been transient, and keeping in touch is one of the hardest things for me to do. For five of those first twelve years, I lived away from my parents. Ironically, when I was in high school and had a chance to make long-term friends, I wasn’t allowed sleepovers unless it was at our house. Urdu is a language that assigns genders to inanimate objects (a chair is female, for instance) and getting those genders right when speaking is a big part of the language. Even after almost thirty years in Pakistan, I don’t always get it. So occasionally, I sound like a bumbling foreigner when I speak Urdu. I’m an indifferent cook. My mother’s favourite anecdote about my cooking adventures is leaving me in the kitchen to keep an eye on boiling rice (which needed to be strained once it had boiled over). She returned to find the rice burned to a crisp and my nose buried in a book. I had been oblivious to the rice burning right next to me because I had been so immersed in my book. It took several charred dinners before she finally stopped asking me to help with the cooking. I hated my first full-time job – a position with a premium graphic design firm that my whole graduating class coveted. It took me more than a year to realise that the work was boring and repetitive and the principals had no interest in teaching me anything. We parted on bad terms and for a long time afterwards, I alternatively hated myself for being a quitter and for not getting out of there sooner. I used to embarrass my brother on the road by singing loud, off-key songs whenever we were stopped at a traffic light. He moved to the US 15 years ago for his residency (internal medicine) but whenever he comes back, I make sure to continue the tradition. He has told me he can kill me with his thumb (he’s a month older than my husband and they have bonded over my idiosyncrasies and creative ways of killing me). I have to thank Nillu for nominating me for this award. Considering how short my blogging career is (barely five months old), I am especially honoured that she chose me. Addendum: The Versatile Blogger Award was initiated here. Thank you for the nomination Natasha 🙂 And I like you, I have been blogging only for a year now! You’re welcome, Sumeetha. I nominated you because I enjoy your writing. You totally deserve it. So cool to read! The one about the songs made me snort, and the one about being so lost in a book that you ruin a meal is totally me. 😀 Moving school so often must have been tough… My parents moved around a lot during the first 10 years of my life, but half of it was in the same area and all of it within Germany. Thank you, Devika! I ruined so many meals this way. And thanks again. Compliments like this leave me in a permanent state of euphoria! I’m sorry to hear about your cousin. I guess most book lovers can relate to the ‘burning food/boiling pot’ stories – I have quite a few of my own. And I am more curious than I admit about how you could commit murder using only your thumb. My brother won’t tell me. He says the element of surprise has a lot to do with it! Congratulations and well done. Look forward to more of your blogs.